As usual, yet another book about photobooths has been written with no mention of our contribution to photobooth history so I have decided it is time to do justice my my own family's legacy and record as much as I can. The story begins with The McMillan Hotel Company Ltd., located in Winnipeg, Manitoba Canada who seemed to be a subsidiary of the Central Steel Corp. Ltd. also from Winnipeg. The McMillan Hotel Company under the direction of Aubrey J. Halter acquires the sole Canadian rights to Metal Typers made by Standard Scale in St. Lois MO. in the 1940's and proceeds to locate them anywhere and everywhere right across Canada, most notably in every single CP & CN Train Station and Bus Depot in the country. 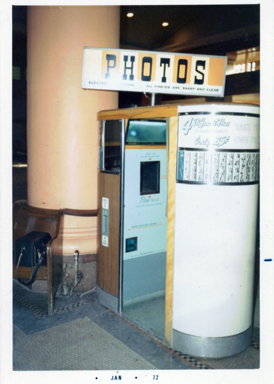 In1952 they set their sights towards capitalizing on the Automatic Photo Studio craze and started purchasing and locating Photomatic booths made by the International Mutoscope Corporation of Long Island New York. 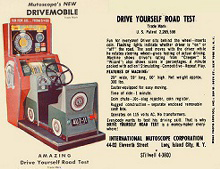 They also puchased several other items from Mutoscope like The Drive Mobile and Lord's Prayer Medallion (faux penny crusher) . 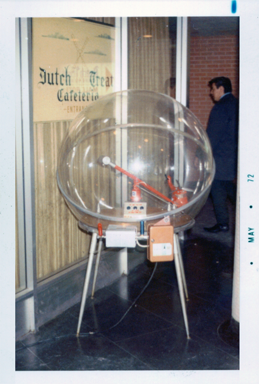 They also added a few crazy machines like the "Shavendor" a coin operated electric shaver and a coin-operated Aqua Velva dispenser and a machine that polished shoes. 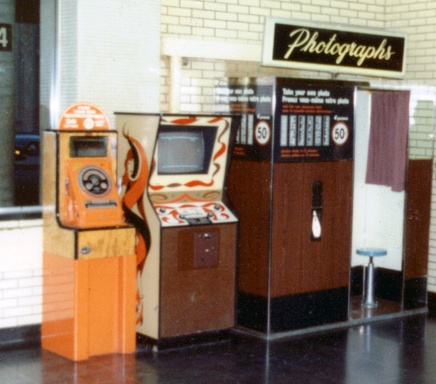 They used their network of Typer locations to place their Photo Machines and other vending equipment in the "better" stations across the country. was in doing the main swap with Model 9's they did also acquire at least 1 - Model 12 and 1 - Model 14 on April 18th of 1960 from Auto-Photo in Montreal. 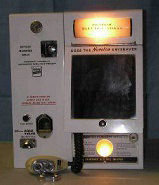 By the end of1960 S&R Vending / E. Rosenblatt Vending were bought out by their General Manager Bob Irving and my grandfather Bob Irvine who traded his Fuel Oil distribution business for a part stake, and The National Vending Company was born. The National Vending Company ran under the direction of Bob Irving as my Grandfather Bob Irvine still owned some land as well as a gas station and truck wash so he was not too involved in the day to day business. 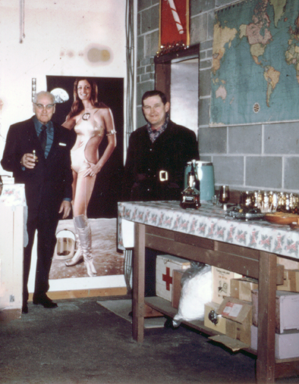 With the additions of the new Auto-Photo machines we began our relationship with The Hanna Corporation (see Hanna page) as a source for all of our chemicals and film. 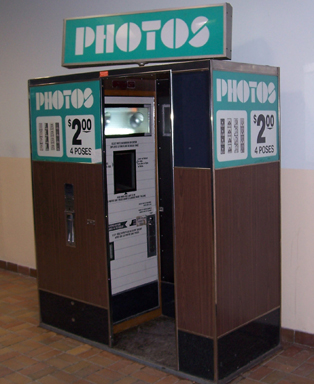 We would also purchase from them Photobooths, Vine-O-Lite picture protector machines and sleeves to be mounted on the Model 9's as well as St. Christopher medalion vendors. The Vine-O-Lite sleeves sold like hot cakes and we were going through at times 10,000 a month. In 1961 The National Vending Company became National Vending Ltd. and moved from it's downtown location to land that my Grandfather owned on St. James St. In the mid 1960's we had a scuffle with A-P M over Canadian distributorship of Hanna film and chemistry A-P M felt that because of their volume they should have sole rights and if we did not have to buy through them we should have to pay them an honourarium on every order that we made through Hanna. I'm sure that this was a tough situation for Ed as his top 2 customers in Canada were trying to cut each other out of the picture. In the end I think it was a draw as we continued to buy from Hanna until around 1970 when due to the poor exchange on the Cdn $ and expensive freight, brokerage & duties we were forced to start our dependance on A-P. The rest of the 60's were pretty much uneventful, we continued to add booths to the stable and pretty much focused on Model 14's as they were light and easy to move once you cut the roofs down. We did have some Model 11's too although I am not sure if they came from the Cdn or US factory. We began adding Model 17's in 1967 and purchased quite a few of them. We also added Model 18's although I have no date as to when they came on the scene... In the late 60's we added the Jaycopter Helicopter that was made in Edmonton, you had to land the copter on three different switch plates without crashing. In the early 70's my grandfather Bob Irvine took on a greater roll in the company and by 1972 Bob Irving was bought out and my Father Russell Eaton became the GM. The beginning of the 70's also brought with it new opportunity with the budding of the video game industry. We bought several sit-down versions of electronic tennis (pong) as well as the deluxe versions with tennis, hockey and 3 paddle soccer. 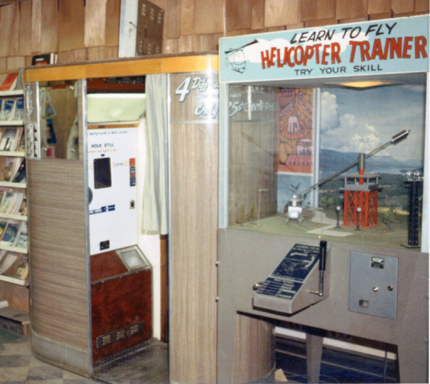 We added Midway's upright tennis machine, flipper (the original breakout) and another helicopter by Midway called the Monster Copter. (as a teenager I went to work with my dad as much as possible to "help" although I would spend the entire day in the back of the shop) Unfortunately we had machines stolen from bars and with only mechanical techs, all the work on these having to be farmed out it was decided to end the video portion of the business. By 1974 with his health failing Bob sold the company to Russell as well as divesting his other assets to various parties. 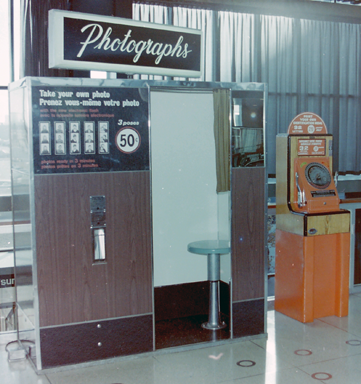 In late 1974 we began to update all the booths to 50 cents and in 1976 we made the switch to bilingual side displays when one of our booths in Ottawa was removed from the floor for having English only signs. 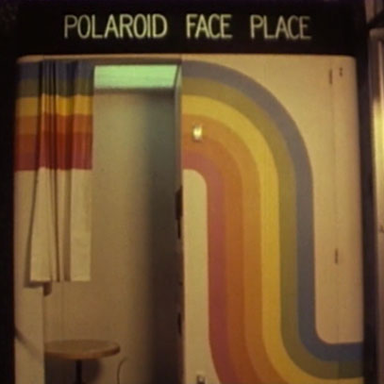 1976 also saw A-P M offering us their colour booths after 3 years of testing. In March of 1980 all B&W machines were set to 75 cents and with the skyrocketing price of film due to silver content we investigated a new technique of separating the silver from the spent bleach solution. The process involved adding a saturated salt solution to the old bleach and letting it stand for several days. The silver would settle to the bottom mixing with the salt and making "silver salts". The silver would then have to be separated from the salts. In the end the idea proved to be far too messy and time consuming to be practical, regardless of how much money we would have "allegedly" got back. In October of 1981 the last 4 of our active Model 9's were returned to the factory as a "trade-in" after the closure of the Big 4, Stylerite and Starland discount stores in Winnipeg. 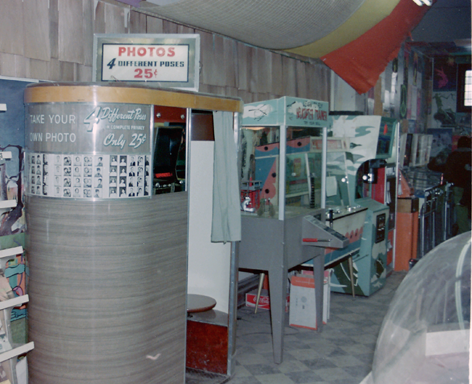 We also traded in numerous Model 9's & 14's for credits towards the purchase of several new colour booths. And while we did put a few of them out in prime locations in eastern & western Canada the majority of them would be located in Winnipeg due to the extra care involved in running them. Also that year we were unsuccesful in obtaining the rights to West Edmonton Mall who opted to go with newer machines from the east. 1983 would see B&W vends increasing to $1.00 although we did not install bill acceptors on the B&W machines. Although I have no documentation of the fact I would venture to say that this is the point when the 4 strip colour booth came out and was set to vend at $2.00. 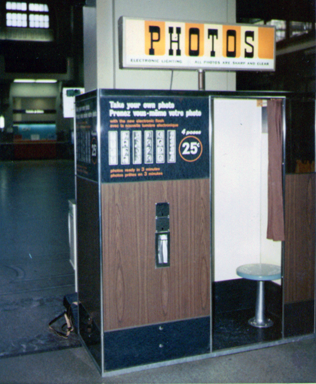 The mid 80's saw the B&W booths going up to $1.50 per vend (6 quaters, yikes...) In 1986 Kodak went out of the photobooth film business and all booths were converted to the new refillalable cassettes. We installed a special shelf in our shop bathroom and it doubled as our darkroom being that it was the only place in the building with no window. 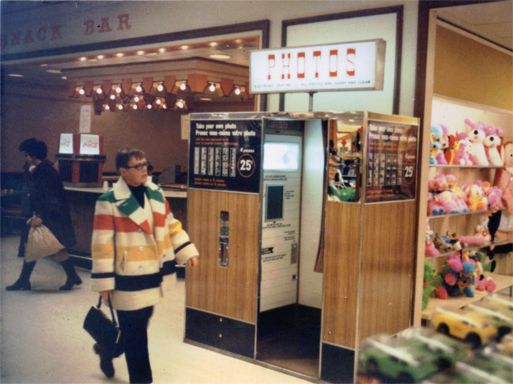 In 1991 the colour booths were set to a $3.00 vend and B&W to $2.00 and our world began to shrink. While we had worked hand in hand with the factory since the 1970's with them doing major service for us in Eastern Canada when our servicemen could not handle a problem and us doing the same for them in the west due to crazy E-W airfare In the 1990's we pulled completely out of Eastern Canada and focused solely on the west. 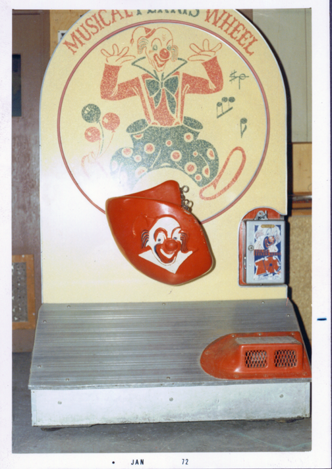 In the mid-90's the processor styled photobooth cabinet was introduced and offered to us and we were given the option to buy the new booths. Due to dwindling business we did not have the capital to buy these booths and ended up losing our locations as they came up for renewal. We withdrew our base of operations to Manitoba and parts of Saskatchewan. In 2003 with the loss of our best location in Winnipeg due to our client's property being transferred to the Mall's Developer my father now in his 60's decided to sell out and retire. Our remaining locations were transferred to Auto-Photo Canada and we shipped a truckload containing 21 booths and 2 crates of parts to them. As we were closing things out we got a bizarre call from a woman to do her wedding with a B&W machine and I was displatched to do it. It turned out to be really fun! My father kept 2 booths that were loacted in rural Manitoba for something to putter with and they ran until 2007. I now do party rentals only although I have been getting calls from trendy night spots who want the old B&W machines to go with their retro decor but in my mind the money just isn't there to cover the expenses, and they don't want digital machines. 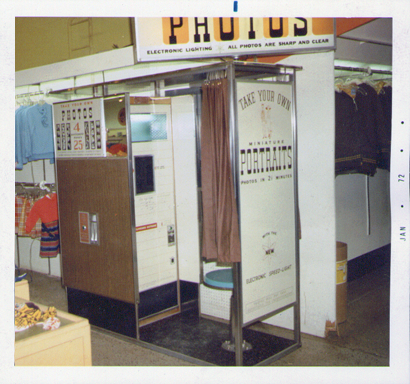 The focus of this page is to chronicle my family's history in the photobooth industry and is not meant to offend anyone or to portray anyone in a bad light. It is unfortunate that this was a time in the industry where you had to contend with your supplier also being your competitor and although one could dispute the ethics of this it must also be pointed out that due to the economic circumstances of the country in which we live, it was impossible to get supplies from elsewhere due to unreasonable freight, taxes and duties. One of our last Model 17's, the machine and location went with the buy-out. 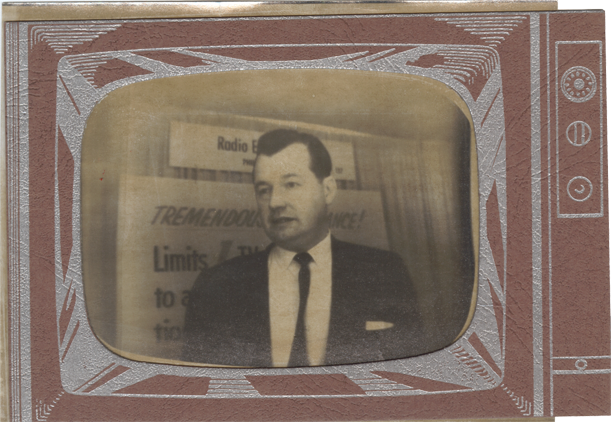 1965 TV Set Photo in a cardboard sleeve by Radio Engineering Co. of PA which used CCTV to produce a print in 10 seconds for a quarter. We were advised by someone who had seen it in operation to pass.